PT PGN LNG Indonesia - PGN LNG is a rapid growing company in Indonesia running business in the field of Liquefied Natural Gas (LNG) industry. PT PGN LNG Indonesia is a directly owned subsidiary company of state-owned gas utility company PT Perusahaan Gas Negara (Persero) Tbk (PGN Group). According to information found in PGN LNG's website as cited by JobsCDC.com, PT PGN LNG Indonesia was formed in 2012 with main objectives to develop LNG business within the PGN Group which consists of natural gas liquefaction, LNG storage and shipping, and natural gas regasification to support PGN Group's main business in gas transportation and distribution to consumers. Since July 2014, PT PGN LNG Indonesia has Foating Storage Regastification Unit (FSRU) located ± 21 km offshore from Labuhan Maringgai - Lampung with a capacity of 1.5-2 MTPA with a shipping limit of up to 250 MMSCFD. PT PGN LNG Indonesia is based in South Jakarta and its principal office is located at Graha PGAS Building, 7th Floor Jl KH Zainul Arifin No 20 Jakarta 11140. Maximum age of 28 years old as of 31 December 2018. Minimum S1 Environmental Engineering, Chemical Engineering, Mechanical Engineering, Industrial Engineering, Marine Engineering, Environmental Health Engineering. Minimum S1 Engineering, preferably Chemical Engineering. Minimum S1 Engineering, preferably Shipping Engineering. JobsCDC.com now available on android device. Download now on Google Play here. Please be aware of recruitment fraud. The entire stage of this selection process is free of charge. 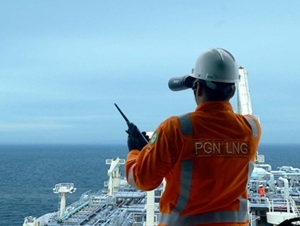 PT PGN LNG Indonesia - S1 Senior Staff Pro Hire Program PGN Group February 2019 will never ask for fees or upfront payments for any purposes during the recruitment process such as transportation and accommodation.